Provide superior heat transfer capabilities when used with a boiler or other hydronic heating source such as a heat pump or solar. 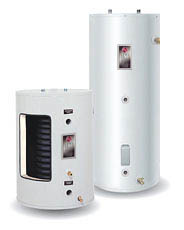 Niles Steel Tank has many indirect water heaters to choose. All provide superior heat transfer capabilities when used with a boiler or other hydronic heating source such as a heat pump or solar. Our internal coils are designed for low pressure drops and high heat transfer capabilities, which make our indirect water heaters the most efficient on the market. Niles Steel Tank offers, single wall and double wall internal coils, residential and commercial products and stainless steel for areas where aggressive water is present. Choosing the correct indirect water heater for your application is easy. Refer to the list of specifications from the list on the left to help you decide which indirect water heater is right for you. Niles Steel Tank designs and manufactures water storage tanks, pressure vessels and steel tanks for boilers.